If you diligently care for your home’s lawn, you’re no doubt aware of the more stringent water restrictions enacted in cities throughout Southern California. Water shortage concerns have front burned conservation efforts and the water required for yard maintenance is under aim first. 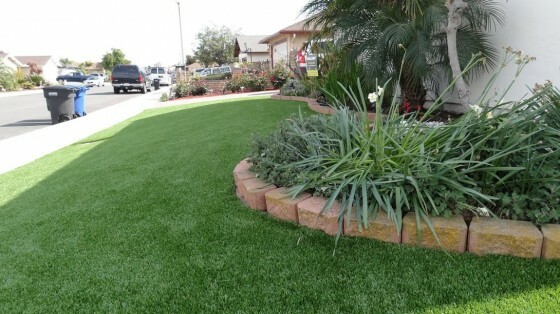 Some districts plan to dramatically raise rates and because landscaping can consume up to 80 percent of your total water usage, many homeowners are considering installing artificial grass, which requires less water to maintain. Even so, myths surrounding artificial grass abound, and may impact your decision. It’s important to look at the pros and cons of every decision, and access to most up-to-date, accurate information helps. 1. You can’t have a dog. Artificial grass surfaces ensure they have an adequate draining system, and additive products are in place to sure an odor-free and clean lawn. 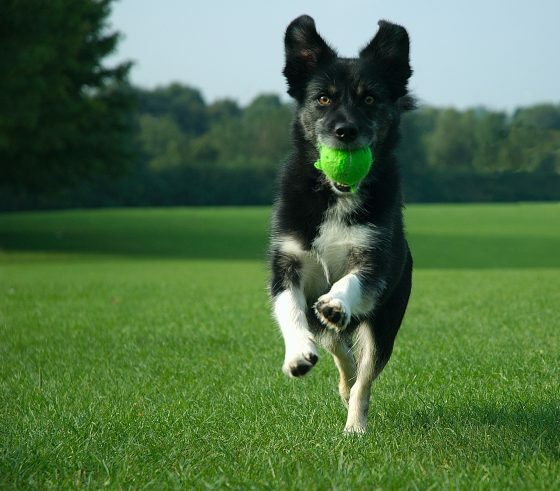 In practice, dog urine is flushed out through the artificial turf’s drainage holes. Just hose it off. Solid waste is removed from the grass in the same way you would do it with real grass. Keep in mind, too, that artificial grass won’t develop bare patches due to pet urine, and are much less likely to be dug up by dogs. This myth may have been true for artificial grasses of the past, or with low-quality products, but it’s not the norm. Artificial grass that use crumb rubber (ground up and recycled car and truck tires), the material often associated with low concentrations of lead, have been banned in many cities, and isn’t installed by reputable companies, including Install-it-Direct. The product we install is environmentally safe and does not contain silica dust, zinc or heavy metals.There are several other infill options available on the market now, most of which are non-toxic and heavy-metal-free. Organic infills such as natural cork are also being increasingly used, and are healthier options. In addition, if you find yourself worried about chemical exposure, consider the risk posed by the pesticides and chemical fertilizers used on real grass. 3. It gets too hot. True, artificial grass can absorb and transfer more heat than real grass, however modifications such as subsurface cooling systems can substantially reduce heat. Installing lighter colors of synthetic grass also help to lower heat, and adding a lighter-colored infill does, too. Shade that keeps direct sunlight off of the artificial grass can prevent complete heat absorption and keep temperatures down. The product we install does not heat up like rubber and doesn’t transfer the resulting heat to the grass. Again, yes, artificial grass is more expensive to install than sod. Yet if you consider the costs associated with watering, mowing, and fertilizing, ongoing maintenance costs are much lower than with real grass. Most experts say that a mid-sized artificial grass installation, will pay for itself within three to five years. Artificial turf can cost up to $12 per square foot to install, and requires very little care. Many synthetic grass systems installed today feature comprehensive drainage systems including a permeable backing layer and drainage layer comprised of crushed rock or other material. The drainage layer, multi-layered backing system, and artificial grass blades that are infilled with a granular filler all promote optimum drainage on par with natural grass. 6. It lowers property values. Maybe it used to be that way, but as water concerns grow, artificial grass can qualify a home as “green,” which is a selling point. 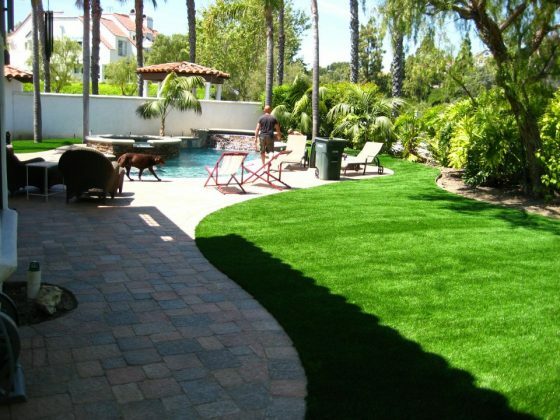 More and more Southern California homeowners are installing artificial grass for lower maintenance and water bills, as well as its year-round well-kept appearance. Any property feature that meets those parameters and is eco-friendly to boot adds to a home’s value rather than detracts from it. 7. You can’t have trees. Trees can be planted in artificial turf. A tree ring needs to be dug with irrigation capabilities, but trees are often planted in and around artificial grass just as they are in traditional grass. 8. It fades over time. Quality artificial grass products incorporate UV inhibitors into the fiber/yarn resin. The most reputable installer companies will also offer a warranty – in some cases up to 10 years as Install-It-Direct does – against fading. The latest generation of artificial grass products mimic a natural grass appearance due to variations in “grass” blades, density, and colors that can be matched to other natural landscaped areas around your home. Also, quality manufacturers develop their products’ grass blades with non-abrasive textures that are soft and like real grass. Install-It-Direct uses crumb rubber-free artificial grass from Global Syn-Turfm which has a light brown thatch built into the turf to make lawns look even more like real grass. 10. It’s bad for the environment. Many artificial grass products are made out from recycled materials, producing less waste. Also, as mentioned, artificial grass does not need pesticides and herbicides, making it an eco-friendly choice. Then when you consider that according to the U.S. Environmental Protection Agency (EPA), the average American family of four uses 400 gallons of water a day, much of it on yard maintenance, the water conservation benefit takes on even more environmentally-friendly significance. The EPA also reports that a push mower emits as much pollution in one hour as 11 cars and a riding mower emits as much as 34 cars. Finally, the EPA states that grass clippings are the third largest component of municipal solid waste in landfills. Artificial grass saves homeowners money and time, and the water conservation benefits – on average homeowners can save up to 50,000 gallons of water a week – seal the deal. When installed properly by a contractor who uses only quality materials, an artificial lawn can last beautifully for years. Have you considered installing an artificial lawn? If you have synthetic grass, what’s been your experience?